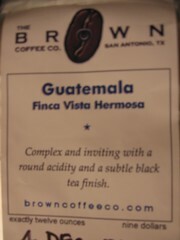 When we first cupped this coffee, we were largely interested in why it was so even and how it was so clean. It seemed that for this price, this coffee was a heck of a steal. It was so evenly sorted and so few visible defects that we couldn't believe the price. When I got the low down from Edwin, the quality we were seeing made sense. The coffee is solid because it comes from an area with potentially good terroir and they must take care of it in processing. We cupped this coffee and got a satisfying experience. It was clean and sweet, the roast smoothed out and the cup clarified as it began to cool. The cupping notes yielded a light layer of roast cocoa, mineral notes, dark sugar, and clean fruit toned acidity underneath. The coffee could go lighter because of it's quality, but I would not enjoy darker. 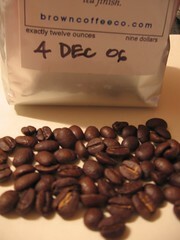 The roast was part of the flavor balance and did not overwhelm the origin flavors allowing them to show through. Making a snap judgement on this coffee was hard, but it really seemed I preferred the clarity of filter over french press in this case. The 'El Eden' was very representative of what I have come to associate with the good flavor characters of the Huehuetenango region of Guatemala and I will probably sample it again in the future.